Exotic and alluring, Luang Prabang is a southeast Asian paradise with a lot to offer travellers and holidaymakers. Take a journey back in time by visiting the city’s old-world temples and museums, where you’ll discover a world that’s remained still amongst the hustle and bustle of the surrounding regions. The city itself is UNESCO protected, and is often referred to as a traveller’s Shangri-La. With unique sites such as the sacred Wat Tham Xieng Maen and the Wat Xieng Thong just waiting to be explored, many travellers come back from their Luang Prabang holiday feeling spiritually and mentally enlightened. Luang Prabang boasts breathtaking scenery. Natural wonders like the Kuang Si Falls and the Tat Sae Waterfalls are popular with tourists. For some spectacular views of the city and surrounding area, head up the Phou Si hill. Here you’ll also find a number of magnificent traditional Buddhist shrines. Our selection of Luang Prabang hotels have been tailored to suit everyone - whatever your budget. From cheap Luang Prabang hotels to some of the most luxurious accommodation in the city, you’re bound to find something to suit your needs. 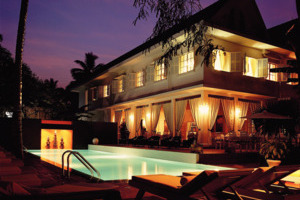 If you’re looking for a budget hotel that won’t break the bank, then the Sala Prabang is perfect. Made up of seven world heritage buildings, this comfortable hotel features 49 tasteful guest rooms to choose from, as well as plenty to do and see in the area. If you want to stay in five-star luxury during your stay, consider the Belmond La Residence Phou Vao. With stunning mountains, temples and lush tropical greenery right on the doorstep, as well as a spa and restaurant serving delicious cuisine, you’d be forgiven for never wanting to leave the resort. Royal Palace Museum - If you want to see some ancient and beautiful artefacts then a visit to the Royal Palace Museum is a must. However, keep in mind that there are no shoes or photography allowed inside. OckPopTok Living Crafts Centre - If you like textiles and crafts, then you’ll love it at the OckPopTok Living Crafts Centre. Here you’ll find weavers, spinners and batik makers producing some beautiful fabrics. Free tours are available. TAEC - This three room museum is a must for history and culture lovers. Here you can learn all about Nothern Laos’ hill tribe cultures. However you choose to spend your time in beautiful Luang Prabang, you’ll find the perfect 2019 or 2020 hotel with us. 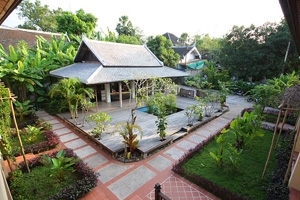 Here is just a selection of our favourite and cheapest hotels in Luang Prabang. Please use our search panel above to find your perfect choice. Situated a short distance from the charming town of Luang Prabang, the Sala Prabang serves as a warm and welcoming haven where elegant designs and an enriched sense of heritage showcase some of the greatest aspects of the regions Colonial architecture. Consisting of seven World Heritage Buildings that make up ... this idyllic residence, guests are treated to numerous comforts, spacious settings and distinct local elements that help set the tone for a soothing stay, combining traditional overtones with modern day styles. 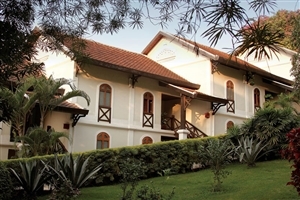 Hosting a total of 49 plush filled accommodations to choose from, an in-house dining venue and plenty to see and do around the vicinity, this boutique escape has been a favourite for artists, ambassadors, business and leisure travellers all seeking a private hotel experience deep in Northern Laos. Marvel at the magnificent mixture of French colonial architecture and indigenous Laos elements that come together to make up the warm and welcoming Angsana Maison Souvannaphoum, a lavish getaway tucked away in the northern Luang Prabang province of Laos that once belonged to four-time Prime Minister Prince Souvanna Phouma, proving ... that this is one holiday haven worthy of royalty. An establishment of heritage as much as it is a soothing haven, this hotel is perfect for lovers of history, tradition and culture as well as those simply seeking somewhere idyllic to kick back and enjoy the serene ambiance of the province, and with so much to do both in and out of the hotel guests are sure to be spoilt for choice on how to spend their days in beautiful Laos. Sat looking out over the charming town of Luang Prabang, the Belmond La Residence Phou Vao serves as a pleasant getaway that invites guests to take in the gorgeous sights of the surrounding area from its lofty vantage point, with mountains, temples and tropical greenery spread out across the landscape. ... Boasting a serene ambiance that permeates throughout the residence and each of its 34 elegant suites, visitors are sure to feel rejuvenated after some time spent at this Laotian haven which provides many soothing facilities and plenty of opportunity for exploration for those looking to venture out into Luang Prabang. Spend time unwinding with spa treatments, enjoy some local cuisine at the in-house restaurant or immerse yourself in the splendour of Laos with a stay at the wondrous hotel.